You meet sceptics every day. They ask questions like: Was Jesus really born in a stable? Did his friends tell the truth? Did he really come back from the dead? Here's a book written in kid-friendly language that gives you all the answers. 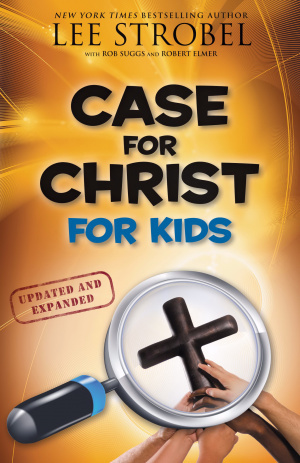 Packed full of well-researched, reliable, and eye-opening investigations of some of the biggest questions you have, Case for Christ for Kids brings Christ to life by addressing the existence, miracles, ministry, and resurrection of Jesus of Nazareth. Lee Strobel's bestselling book on the reality of Christ is adapted for a new generation. Case for Christ for Kids by Lee Strobel was published by Zondervan in May 2010 and is our 2677th best seller. The ISBN for Case for Christ for Kids is 9780310719908. Be the first to review Case for Christ for Kids! Got a question? No problem! Just click here to ask us about Case for Christ for Kids. A:This book is best suited for ages 9-11. Thank you for using the Q&A Forum.